VW's Winterkorn says the auto industry crisis won't be over for a long time. 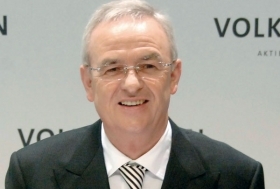 WOLFSBURG - Volkswagen AG CEO Martin Winterkorn used a VW brand management meeting to provide a brutally honest look at what is forecast to be a difficult year. "The core message was that we have to be well prepared," a participant at the meeting said. Winterkorn told the gathering that the auto industry crisis won't be over for a long time. VW will have to work hard to stay on track but "if we do everything right together, then we will emerge from the crisis stronger than ever," Winterkorn told his audience of 2,000 company executives in a hall at the trade fair grounds in the eastern German city of Dresden. In contrast to previous years, VW expanded the scope of invitees to the annual meeting to include young managers. Winterkorn wants to reach rising executives will lead VW in coming decades, a company insider said. Under VW's Strategy 2018 plan, Winterkorn aims to replace Toyota as the world's biggest automaker in terms of unit sales, earnings as well as customer and employee satisfaction. Horst Neumann, VW's personnel chief, presented details a new bonus arrangement for top managers that is based on long-term company goals and replaces the current stock option program. VW production chief Jochem Heizmann announced innovative methods to improve productivity in vehicle factories. A speech by VW sales chief Christian Klingler focused on sustained improvement in customer satisfaction. Following Klingler on the stage, VW's new marketing chief Luca de Meo acknowledged the need for VW to catch up in direct customer contact, for example with blogs on the Internet. VW advertising must be more creative, he said. De Meo, an Italian who joined VW from Fiat S.p.A. last year, made his presentation in German, which "went down very well," a participant said. Karl-Thomas Neumann, former CEO of the German supplier Continental AG, who is now VW's chief officer for electric traction, reported on the planned bundling of work on electrically powered vehicles by VW subsidiaries such as Audi.